Santos is a multi-purpose, clean, creative, fully responsive and powerful WordPress Theme. 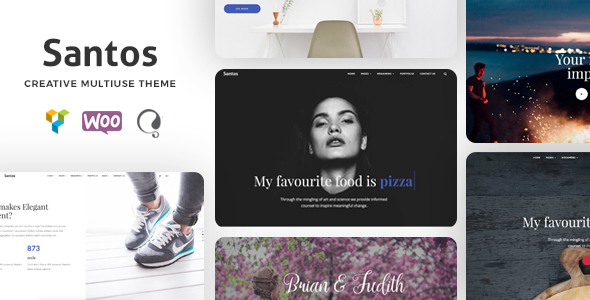 Santos theme included multiple header layouts, drag & drop visual page builder, powerful theme options panel, parallax background , Google Font and more Great Features. Santos is the best choice for your business, creative agency or personal portfolio, photography or a blogging website. Clean and standard Code HTML5 / CSS3 Tested by W3C Validator. There are +30 shortcode ready and 35 different Pre-Built section layout are available to display on any of the pages using our Page Builder then you can customize with an easy Drag & Drop the way you love. There is also option to filter available Pre-Built content Block based on itâ€™s type.